Brandon Clarke's breakout season continues. In one moment Brandon Clarke is in the air, around the basket, ready posterize an opponent with a highlight-reel dunk. Or, maybe he's about to block someone's shot into oblivion. Either way, Brandon Clarke is in the air, around the basket, about to do something that will send the energy level at the game through the roof. And, a moment later, he's jogging back down the court looking as calm as can be. "He does a pretty good job of taking a business approach to the game of basketball," teammate Zach Norvell Jr. says. "He can have a monster dunk but he'll get right back to being level-headed and knowing it's the next play. That's big-time for us, with him being one of our key pieces. He's a guy who can get the crowd going but also stay level-headed and stay in the moment." When Clarke arrived in Spokane last season he was about as unknown as an upperclassman on Gonzaga's roster could possibly be. The 6-foot-8 forward spent the first two years of his career at San Jose State, where he earned all-Mountain West Conference first team honors as a sophomore. But the Spartans have had just one winning season this century and have finished with less than 10 wins more often than not. Clarke was a great player toiling away in obscurity. Earlier this month Clarke was named as a finalist for the Wooden Award, given to the best player in college basketball, and the Naismith Defensive Player of the Year Award, which is a bit more self-explanatory. Clarke recorded over 100 blocks during the regular season. Before him, the single-season record at Gonzaga was 70. "When he gets on the court, you gotta get out of the way." For the guys in the program this hasn't come as much of a surprise. 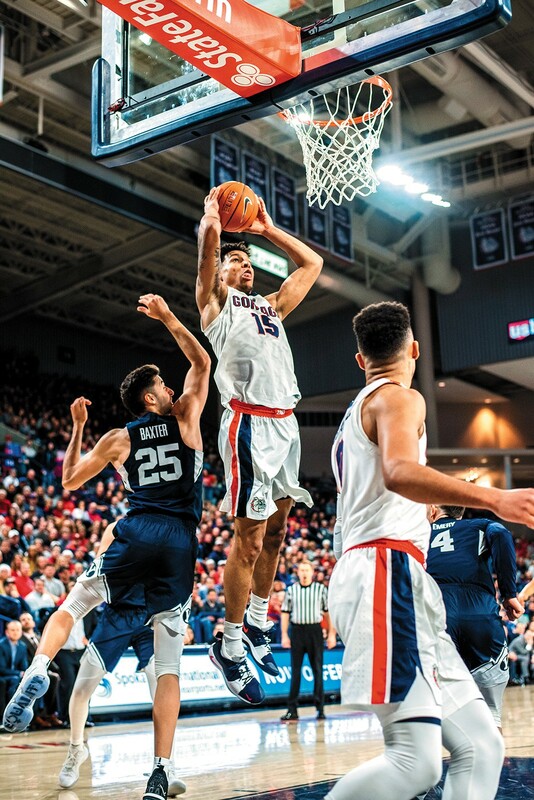 Clarke spent last season refining his game, taking advantage of a redshirt year like so many Zags before him. "One of his first practices, it was an open gym and we were just playing pickup," Corey Kispert says. "Afterwards we were messing around he went and tried to touch his head on the rim and he actually cut his lip on the rim jumping so high. We all knew he was athletically gifted." It's not all hard work for Clarke, though. The balance he shows on the court, with bursts of emphatic energy surrounded by stretches of serene composure, appears off the court as well. When he's not working on his game, he's playing games. Each of his teammates told me the same thing when asked what he would be doing in his downtime. "Playing Fortnite, 100 percent," Kispert says. "That's probably a pretty common answer. He's the best we got so, whenever he's on and I'm on, it's a privilege for me." Clarke doesn't disagree about his video game prowess. "Yep. I am, yeah," Clarke says with a laugh. "Probably just the best at video games in general but Fortnite is the main game that we all play. I guess the guys always like talking about our Fortnite rankings. I've been at the top all year, though." For a guy who has spent all season saying little, and focusing on his teammates when he has spoken, that's a surprising bit of attitude. But, when you're the best, you may as well enjoy it. Which is clearly what Clarke and his teammates are doing off the court, as well as on it. "He's super relaxed. Super chill. Really, really easy going," Kispert says of Clarke. "Maybe it's all just pent up inside of him, but when he gets on the court you gotta get out of the way because he's coming after everybody." Gonzaga plays Florida State Thu, March 28, at 4:09 pm. The game will air on CBS. The original print version of this article was headlined "The Quiet Superstar"